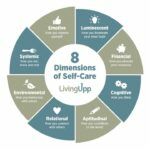 The 8-Day Living Upp Self-Care Challenge is a self-paced training series designed to help you examine your self-care habits more closely. Each day of the challenge, a new training video will be delivered to your inbox. Want the 8-day challenge, along with some other great self-care tools? Upgrade to the Self-Care Starter Kit here. Is it time to up your self-care game? The 8-Day Living Upp Self-Care Challenge is a self-paced training series designed to help you examine your self-care habits more closely. Each day of the challenge, a new training video will be delivered to your inbox (using the email address you entered when you registered), and you’ll have access to the recordings for 30 days after completion. Over the course of 8 days, you’ll be exploring each of the 8 Dimensions of Self-Care through a daily challenge to help you develop habits that better support you. BONUS: You’ll also be invited to a closed Facebook group where the self-care conversation is already going strong. Learn from others who are also exploring The 8 Dimensions of Self-Care, post comments to create accountability, and get the encouragement and support you need to create a self-care practice you love.